Keith Ivens, area flood risk manager for Natural Resources Wales, said: “We are working hard to improve the level of protection for people living in St Asaph and have already introduced a series of measures to do this until we are able to implement the long-term solution. 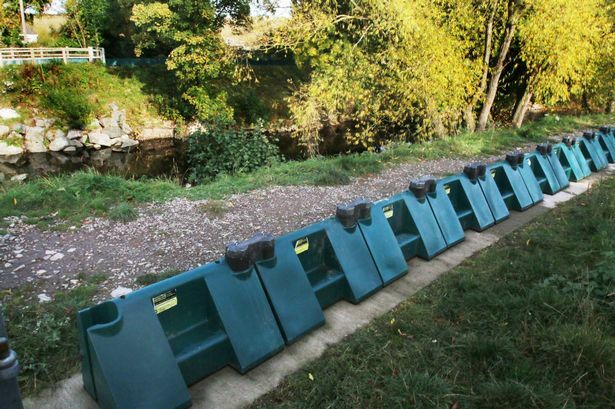 “These include removing vegetation from the riverbank, raising the existing embankment, putting new removable screens on Spring Gardens bridge, purchasing temporary barriers and reviewing our operating procedures. The barriers are left in place over the winter months on the crest of the river bank. The deployed barrier increases the height of the existing river bank at its lowest point. Floodstop is an ideal solution due to it robustness and small footprint when deployed. Fluvial Innovations supplied the system in dark green so that it was inkeeping with the surroundings.